Pack size: 1 x 360ml bottle. Review Lens Plus Ocupure Saline Large Lens plus rinses contact lenses very well. Contact lenses are very comfortable to wear after rinsing. Review Lens Plus Ocupure Saline Large Great value compared to buying in pharmacies! Saline solution is one of the most effective substances for cleaning and treating contact lenses. Able to remove most known germs and effective in scrubbing off dirt deposits, the Lens Plus Ocupure Saline Large is a fine cleaning product which is easy on the eye and 100% effective. Specially designed to mimic substances found on the eye, this is a smart solution for your lens cleaning needs. 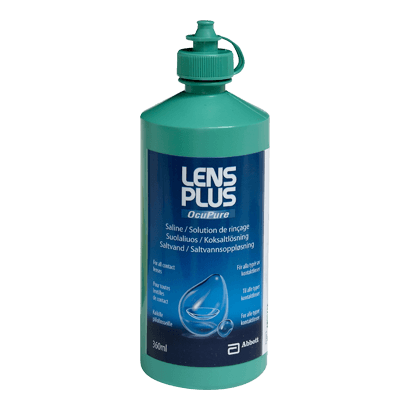 • Lens Plus Ocupure Saline Large comes in a 360ml bottle which lasts approximately a month and a half when used regularly for cleaning and storage. • The Ocupure substance used in the Lens Plus Ocupure Saline Large has been found to have the same pH level as substances in the human eye, which means that when lenses are replaced after cleaning, they will not irritate the eye due to acidity or alkalinity. • The Lens Plus Ocupure Saline Large is also a long-life product, which has been engineered so as not to degrade in strong light. It will also help to retain moisture on the eye and prevent protein or lipid build-up. • The manufacturer recommends that lenses can be immersed in Lens Plus Ocupure saline Large for up to one month before a new bottle is required. • If protein deposits are a particular problem, special protein dissolving tablets can be used safely with Ocupure for enhanced cleaning. Produced by Abbott, one of the world's leading vision specialists, this is a superb cleaning product which mixes advanced technology and ease of use and will suit all contact lens wearers.